From winner Brad Keselowski to last-place finisher Cole Whitt, here’s how NASCAR Sprint Cup drivers finished in the Kobalt 400 on Sunday at Las Vegas Motor Speedway. Drove past Las Vegan Kyle Busch for second LVMS victory. 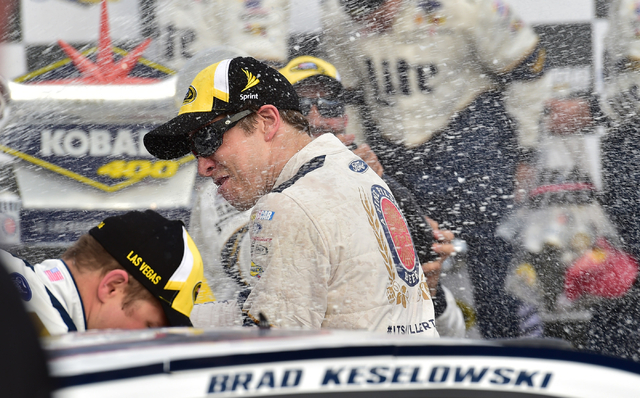 Led seven times for 70 laps to make it a 1-2 Penske sweep. Four-time Las Vegas winner paced race-high 76 laps. Charged from 23rd to lead before bad vibration. Familiar No. 3 car fast on track, slow in the pits. Another solid run for Wood Brothers’ rookie. Flu-ridden driver leads a lap, settles for sixth. 8. (20) Dale Earnhardt Jr. Fan favorite — and then some — gets another top 10. Dominated early before getting popped in pits for speeding. First top-10 finish of season for steady veteran. 11. (10) Martin Truex Jr.
Had some good runs but handling not there. 12. (16) Ricky Stenhouse Jr. Solid run derailed by pit road speeding ticket. Veteran still looking for consistent speed. Started, finished middle of the pack. Lead-lap finish for former Daytona winner. Steady drive forward for former Daytona champ. Involved in big Turn 2 fender-bender. Led race early, but not for long. Held up Jimmie Johnson in traffic, was none too pleased. No TV mention until 40th lap. Moved up from 35th, but not among contenders. Last man on lead lap. Richard Petty driver was expecting more. Promising youngster whose day will come. Another Richard Petty driver comes up short. Rick Hendrick protege was never a factor. Former ARCA Rookie of the Year soldiers on. Midwest driver still seeking breakthrough. Only starter in field with middle name of Guido. Dr. Pepper car fizzes out. Junior’s nephew gets some experience. Noncharter driver cashes a check. Tony Stewart’s pinch hitter goes down swinging. Challenging for win before losing control, wrecking. Daytona 500 pacesetter collected in big crash.